Konnyaku is probably one of the stranger foods for Westerners, and is not often found outside of Japan. It is made from the root of the konnyaku plant, a variety of yam. This is boiled, mashed and poured into a wooden box, where it forms a dense rectangle. When cool, the result is a slippery gray mass flecked with brown that has the consistency of very dense jello and seems more akin to something from the sea, such as wakame, than something from land. Konnyaku has no flavor of its own, but soaks up the taste of whatever it is cooked in. It also has zero calories, so it is a popular diet food. 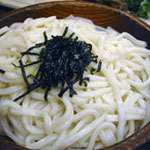 Konnyaku is also made into white, partially translucent noodles called shirataki. 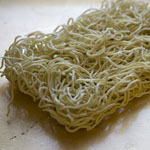 Ramen noodles originally came from China, and have become a beloved fast food for many, and a cheap food source for poor students around the world. The packaged variety available in the West bears little resemblance to the real thing, and the dry soup stock is loaded with sodium and chemicals. Ramen is also referred to as chuka-soba (Chinese soba) and is made with wheat, water and eggs. 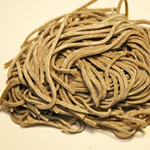 Soba noodles have become increasingly popular outside of Japan, and it is my favorite kind of noodle. Made from soba (buckwheat) flour, which is very healthy, it is mixed with wheat because alone, buckwheat doesn’t have enough gluten to hold together. Fresh soba is a delight, but is hard to find outside of Japan. The dried variety is quite good as well. It is eaten cold, with a flavored dipping sauce, or hot, in dashi broth. The variety of toppings seems virtually endless, from simmered mountain vegetables, nishin (simmered herring) grated yamaimo and more. 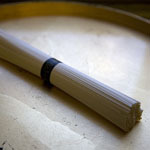 Somen is associated with summer, because the thin white noodles (thinner than angel hair pasta) are best served chilled. Served in bowls of ice water, with dipping sauce flavored with ginger, somen is just the thing to eat when your appetite isn’t great. The chilled noodles have a light texture and flavor, and provide relief from the heat and humidity of summer. In Takao, which is famous for its clear, icy cold spring water, platforms are set up over the river and an elaborate maze of bamboo sluices is filled with somen, which floats languidly by. Diners pick the floating strands of somen with bamboo chopsticks, while enjoying the cool breezes off the river.